8bGames - 8b Irish Lad Escape is a point and click escape game developed by 8b Games. Imagine that you went to an Irish lad’s home to pick him up for a party. Unfortunately he got stuck in a room in his house. 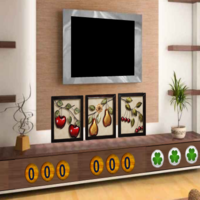 Find some hidden object to solve some interesting clues to escape the Irish Lad. Good luck…Have fun! Now to figure out the other 3 numbers and letters!